My breed was developed in the 1850�s by James Hinks of Birmingham, England. His breeding program included the bullbaiting bulldogs as well as the now extinct English White Terrier. The bulldog ancestry has contributed significantly to my fearlessness and strong will, making obedience training at an early age imperative if I am to learn proper family and household behavior. My short, sleek coat comes in pure white, or any color with white markings and requires minimal grooming. If you are thinking that I look familiar and just can�t place me, it might be that you have seen me on television playing the part of Spuds MacKenzie! When fully grown, I am between 21 and 22 inches tall (53.3 to 55.9 centimeters) and I weigh between 52 and 62 pounds (23.4 to 27.9 kilograms). We have no Bull Terrier Breeders listed at this time. 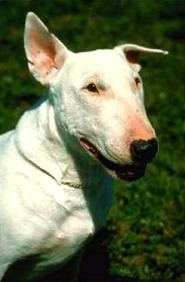 Click here to place your Bull Terrier Ad!